Location: Montluçon, in the Allier departement of France (Auvergne Region). Ownership / Access: Now open for Exhibitions. Notes: Château de Bien-Assis is a feudal residence of the fifteenth century located in Montlucon in Allier in France.According to ancient texts, Colas Peret (also called Nicolas Dupeyret) was lord of Bien-Assis in 1481. The castle, with its style, the second half of the fifteenth century. The castle then passed successively in the families of Chasauvert, Mercier, Tardé, Alamargot, The Bleeding of St. George, then Ms. Sarret selling the MM. Jean and Richard Montaignac, which leased it to farmers. 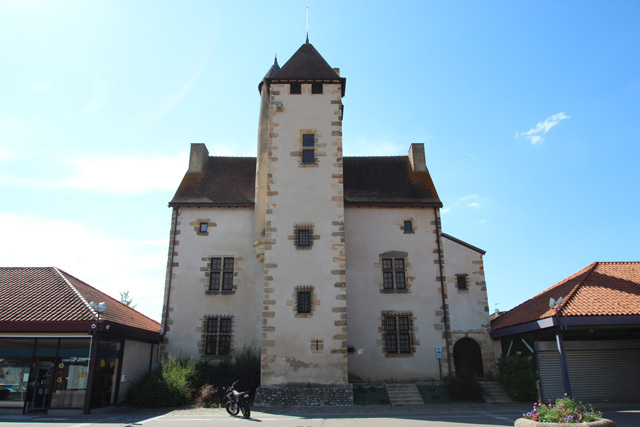 Following an expropriation measure, the castle was recovered by the city of Montlucon, which gives way to the Bourbonnais Equipment Company which was demolished as part of the construction of the new neighborhood Well-Assis. In 1970 the Friends of Montlucon buy Castle Sitting Well-to save it from demolition. The price Emile-Male 1993 was awarded to the Company for the restoration of the building of the fifteenth century included in the supplementary inventory of historic monuments once December 9, 1929, unsubscribes and reinstated March 17, 1933 December 20, 1965.